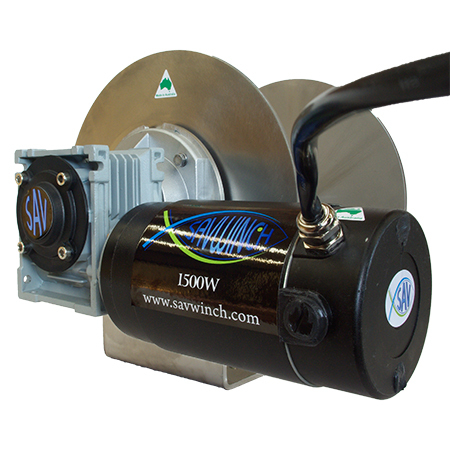 Savwinch 12 volt and 24 volt motors are proudly manufactured in Australia. Through years of continuous development through testing, We are proud to say that we have a fully tested and sealed motor from water and corrosion. An advantage of a Savwinch over other winches on the market is that we do not have any exposed terminals, as we have a motor that is o-ringed and silicone sealed, eliminating the risk of corrosion. Covers are not required over motor as this will cause corrosion and potential failure due to motors not being able to breathe once moisture gets in, compared to Savwinch, as our motors will dry quicker eliminating the risk of corrosion due to moisture. We are proud to say that our motors still remain to be one of the quietest on the market. Feel free to contact us today to get your hands on a Savwinch.